Unlike some of the most publicized acceptance speeches, these do not have to be a long list of 'thank you, thank you ...' punctuated by sobs or silence because you're scrabbling for a clean tissue. Neither do they need to be so flippant or brief they minimize the people honoring you. Good acceptance speeches find a balance, blending gracious humility with sincere acknowledgment and perhaps, a little humor. These guidelines were written as a result of my own experience. 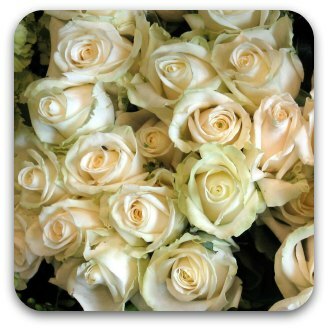 Yes, dear reader, I gulped and gawped at an expectant audience, managing a few tearful 'thank yous' before being gently steered off stage sniffling into a huge bunch of creamy-pink roses. Not an acceptance speech I'd encourage anyone to copy! In my example above there was little time to prepare but had I been thinking I would have realized a speech could be called for. I wasn't, and the result was temporarily embarrassing. If you DO know you're going to be honored, preparation will save you from a similar fate, particularly if it's likely you'll be overcome emotionally by the occasion. She traveled 10,000 miles to say thank you! Read Birdland School Principal Olive Mumba's inspirational award acceptance speech. 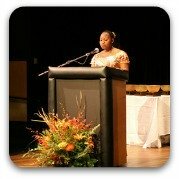 Olive delivered this speech at a dinner given in her honor in Seattle where she received the 2009 Seattle Academy Arts and Sciences 'Future Building' Award for her outstanding commitment and work to give the children of her community in Lusaka, Zambia an opportunity to learn. - whether it's formal or informal, day or night time? - and if you're expected to cover any specific subject matter. Remember people love stories. Tell them but keep them tight and to the point. Give them snapshots into where your life was and where it's going now, perhaps as a result of the opportunities made possible through this award. It's good to be witty and amusing but be really careful. Even self-deprecating humor can backfire badly. These people are honoring you because they thought you deserved it. Mocking yourself may take away from them as well. Click the link to find out more about how to use humor in speeches. If you need tips to help you through the writing process - to get from your notes to words flowing smoothly, this page on how to write a speech will assist. There's also a handy down-loadable printable fill-in-the-blanks speech outline following the standard 3-part speech format (opening, body, ending) to keep you on track. Speeches, especially brief ones, are better delivered without reading your text word-for-word. 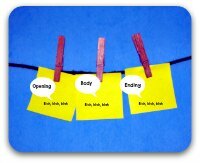 Use *cue cards to help you remember the main points and rehearse until you are fluent. and use cue cards successfully. They do make a positive difference. Your speech will appear more spontaneous and direct through using them. For smooth assured delivery you need to practice. This page will help you make the most of your rehearsal time. It is full of effective easy-to-use tips and techniques. Lastly, enjoy the experience and congratulations on your achievement!